Easter is almost upon us, and that means it’s time to make Carrot Cake! I think the Easter Bunny herself/himself would enjoy this amazingly delicious Carrot Cake with Caramel Spiced Pecans…Santa gets cookies, so I’m thinking the Easter Bunny gets Carrot Cake, just sayin’. 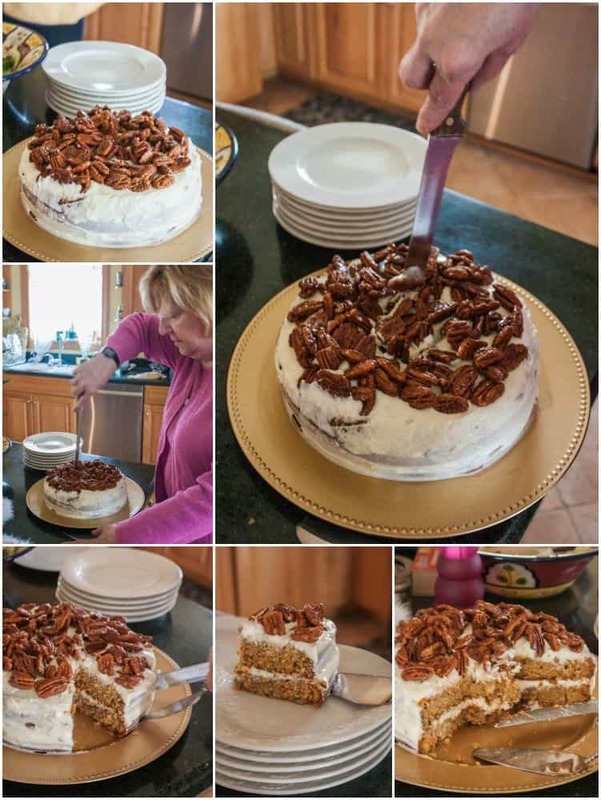 The spices in the cake and from the pecans are perfectly complimented by the cream cheese buttercream frosting, plus, you get the wonderful crunch from the pecans! Truth be told, I have been a little busy lately and decided to make a Petite version of Carrot Cake (aka using one bowl to make the batter and only making one layer) and then after making the cake and frosting it, I looked over to see a bowl of Caramel Spiced Pecans that I had made and added them as a topping and this marvelously delicious take on Carrot Cake was born. This may be my new favorite cake…yeah, that’s saying a lot! To make this cake you’ll need one batch of caramel spiced pecans from this post. Preheat oven to 350. To make the cake simply put all the dry ingredients in a bowl, then shred the carrots into the bowl, mix, then add the eggs and oil and stir. Spray a springform pan with cooking spray, spread the cake batter evenly and bake for 30 min. Remove from oven, allow to cool before frosting. For the frosting make sure the cream cheese is at room temperature (otherwise you'll get clumps in the frosting) then beat it with a hand mixer with the vanilla until smooth, then add in the confectioners' sugar and beat until everything is combined. 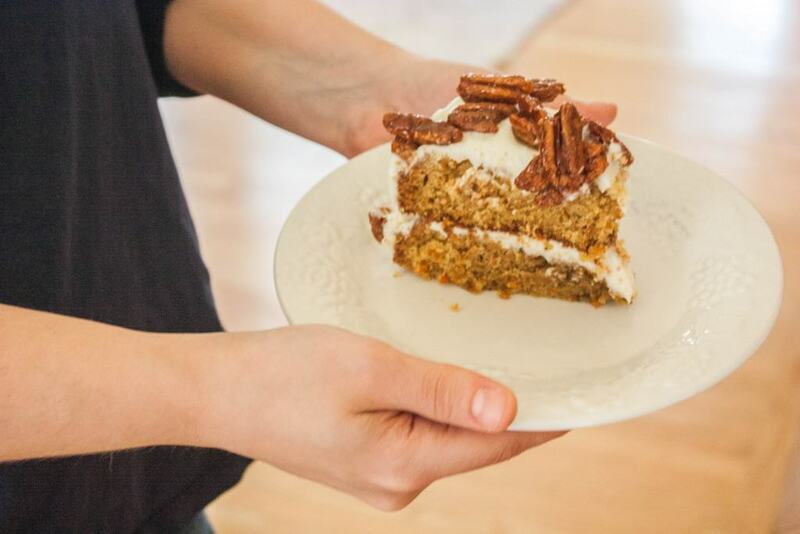 Spread the frosting over the cake, then sprinkle with the pecans and enjoy! ch pecan on top with the very delicate carmel taste, plus the incredible icing. 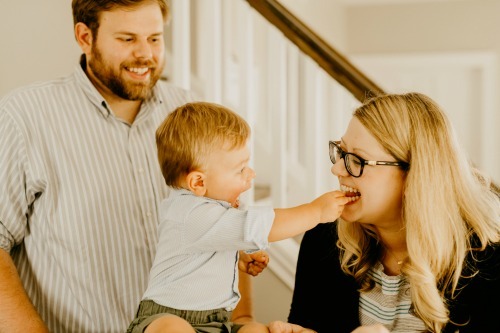 It will definitely be an Easter favorite of ours. Yay! Thank you for the compliments and comment, totally made my day!! Carrot Cake makes me so happy this time of year, and I love that you dress it up with these tasty pecans. Since it’s petite, I can have two slices right? Another great recipe, always look forward to your post Sweetphi, Happy week-end! YAY! So glad you liked it…and thanks for commenting!!! Serve me up a slice of THATTTTTTT!!!!!! 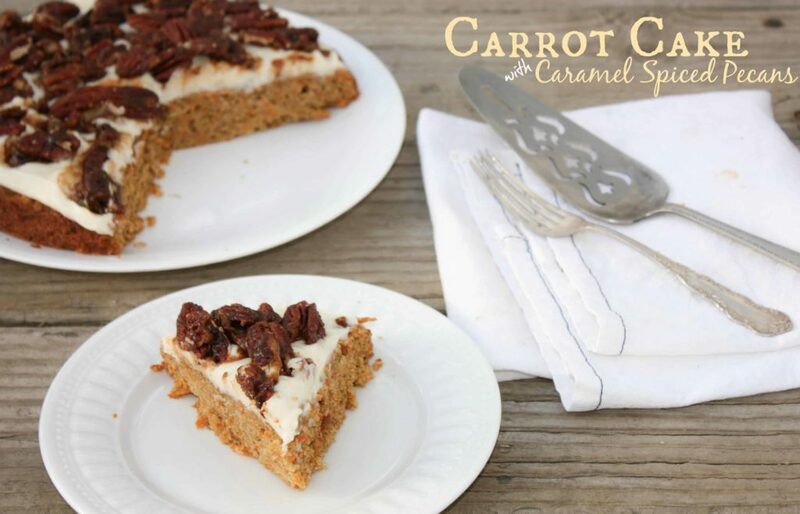 So many good lookin’ carrot cake recipes lately! 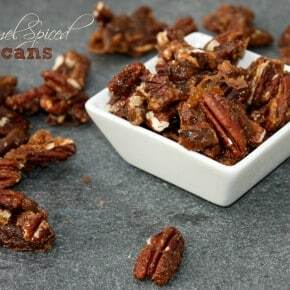 This sounds sooooo good – especially with those caramel spiced pecans!